Here you will find the different steps of the project, listed chronologically, with Samuel Côté’s comments. Preparing for the research mission. We have plenty of indicators; let’s get into the field to check them! The Coriolis II will cast off from Rimouski tonight and head to Halifax. Over the next few days, Coralie Monpert from CIDCO will be collecting bathymetric data. Objective: find the Mount Pindus, the Mount Taygetus and the Oakton. The Coriolis II arrived in Halifax last night. As we have several targets, a CIDCO team will return to the Gaspé Peninsular this week. Aboard the F.J. Saucier, hydrographers will collect other data. 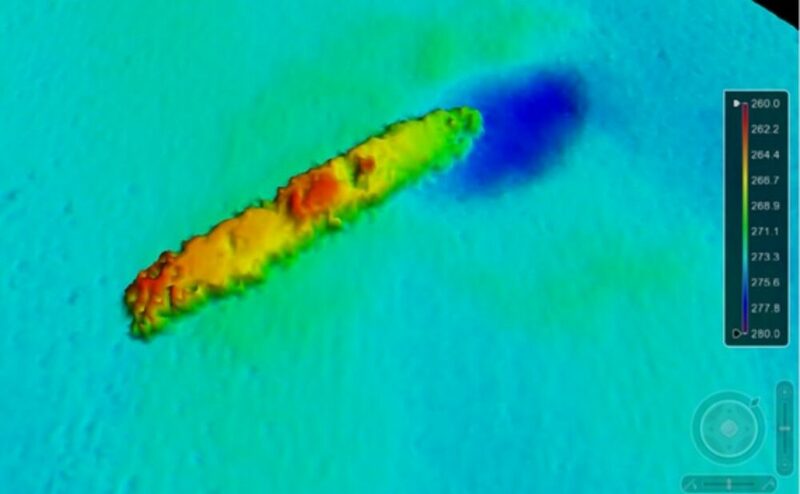 Then, we will analyze the bathymetric data collected during the missions to confirm whether or not we have found wrecks from the Battle of the St. Lawrence. CIDCO is back from its mission on the Coriolis II. Results: The wreck the CHS identified as the Nicoya in 2005 has been mapped, and we might have detected three other wrecks en route! Here are some pictures from our mission. Samuel Côté has spent the last few months consulting German and Canadian primary sources, in order to collect as much information as possible about the torpedo attacks and the likely positions of wrecks from the Battle of the St. Lawrence. Samuel’s work led to the identification of Greek ships the Mount Pindus and the Mount Taygetus, as well as Canadian ship the Oakton at the end of October. 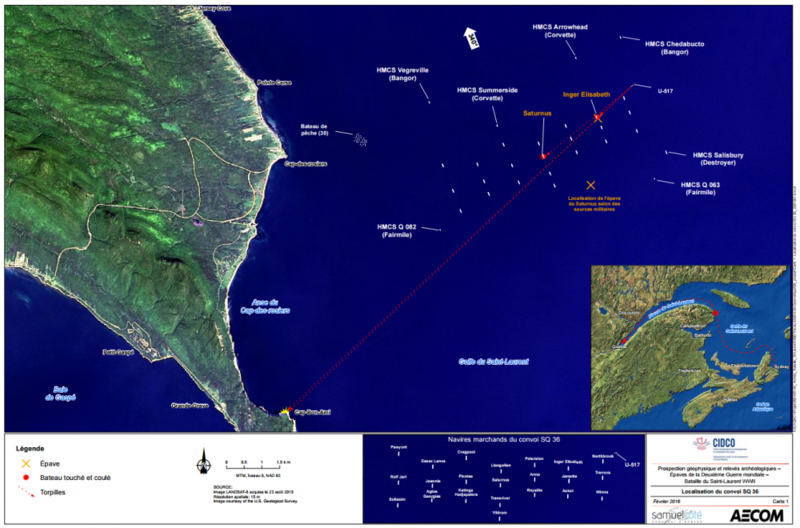 The three ships are located 215 metres (710 feet) below the surface, approximately 34 kilometres off the coast of Cap Gaspé. 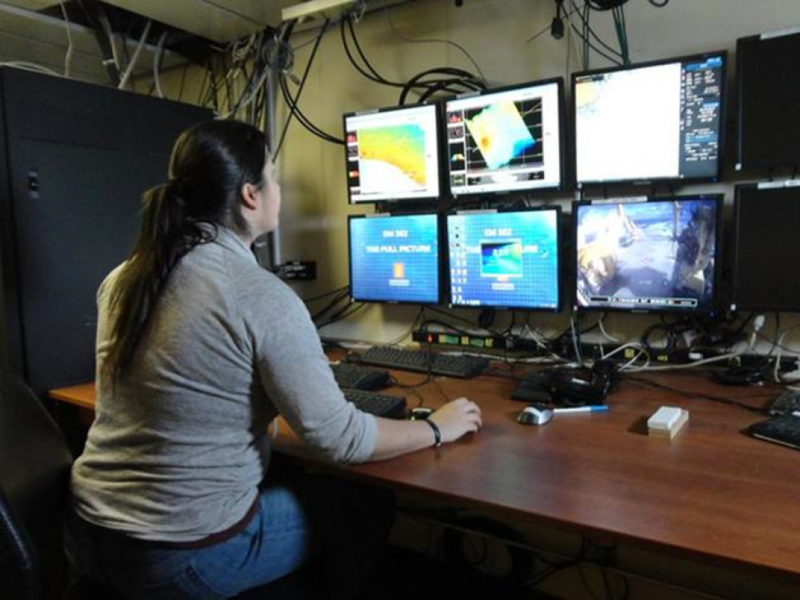 CIDCO’s Coralie Monpert was responsible for collecting bathymetric data aboard the Coriolis II during its mission on the Gaspé Peninsular. At 17:01 on September 7, 1942, the U-517 fired three torpedoes that all hit their targets. The Mount Taygetus and the Mount Pindus, which were carrying armoured tanks, and the Oakton, which split into two, all sunk quickly. They were part of Convoy QS-33. Fairmile Q-083 rescued the 78 survivors from the torpedoed ships. The CIDCO team located two new wrecks off the coast of Cap-des-Rosiers. The wrecks that the CIDCO team found on November 18 are from the Battle of the St. Lawrence. The Inger Elisabeth was located 130 metres (429 feet) and the Saturnus 98 metres (323 feet) below the surface, approximately 8.5 kilometres off the coast of Cap-des-Rosiers. Finding these wrecks would not have been possible without the incredible teamwork of everyone involved. During the afternoon of September 15, 1942, Paul Hartiwig launched an underwater attack as Convoy SQ-36 passed by Cap-des-Rosiers. At 12:33, the U-517 fired four torpedoes at the convoy. Two hit their targets. The Inger Elisabeth, which split into two, sank within five minutes, and the Saturnus, severely damaged at the rear-end, sank within 15 minutes. The two other torpedoes hit a cliff. Four sailors lost their lives during this attack. Thankfully, the sailors had time to take to their lifeboats. The survivors disembarked at Cap-des-Rosiers.